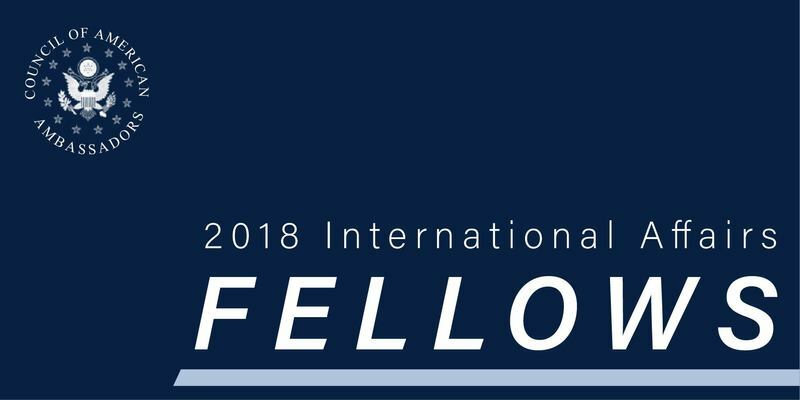 The Council of American Ambassadors is pleased announce the selections for the 2018 Annenberg Fellowship and the 2018 CAA Fellowship. Congratulations Fellows! The CAA Fellowship program is designed to foster the development of the next generation of American diplomats. Of the CAA Fellows selected each year, six are named Ambassadors Walter and Leonore Annenberg Fellows. Since 2004, the annual fellowship program has offered rising seniors selected from among the Department of State’s summer internship class the opportunity to receive mentoring from former United States ambassadors, to enroll in advanced coursework in foreign affairs and economics, and to attend various Council panels and events. These Fellows are “some of the most outstanding young leaders in the United States and have great potential to make important contributions to our country,” stated Ambassador Abelardo L. Valdez, CAA President Emeritus and Fellowship Program Founder. The Council of American Ambassadors is the association of non-career United States ambassadors. A nonprofit and nonpartisan organization, the Council aims to enhance America’s conduct of diplomacy. The organization sponsors fellowships to develop young leaders for careers in public diplomacy and international affairs and conducts semiannual conferences. The Council also convenes roundtable member discussions and “Taste of Diplomacy” luncheons with Ambassadors to the United States, organizes overseas fact-finding missions, publishes a bi-annual journal, The Ambassadors REVIEW, administers Ambassadors Perspectives, an online forum for commentary, and hosts the podcast series, CAA Live! The Council maintains a website at www.americanambassadors.org, LinkedIn and Facebook pages and a Twitter account (@AmerAmbassadors).